Norbert Siedler missed a podium-result only narrowly at the VLN Endurance Championship‘s fourth race of the season. 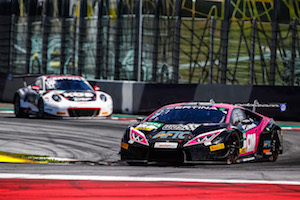 Despite an additional pit-stop the Tyrolean and his team-mate Frank Stippler (D) crossed the finish line in fourth position. After three hours Siedler even led the race. 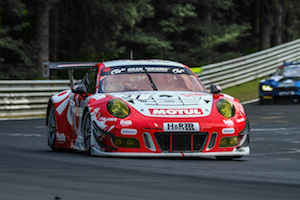 For the first time in this season the Frikadelli-Porsche was equipped with Falken-Tyres. Norbert Siedler was not satisfied with the eighth position in qualifying on Saturday morning. “Neither Frank nor I had a lap without traffic or yellow flag zones. A much better result would have been possible,” he analysed. Despite the early pit-stop Norbert Siedler claimed the leading position 40 minutes before the end again. “Unfortunately we had to refuel one more time which dropped us back to position four,” the Porsche-driver explained. With enough fuel and fresh tyres the Austrian gained more than 15 seconds against his opponents in the last three laps. In the end the Frikadelli-Porsche finished less than five seconds behind the third-placed car. But the fourth position was the best result of the season for the team from Barweiler as well. Norbert Siedler’s next races are on the schedule in two weeks, when the ADAC GT Masters holds its event in Zandvoort (NL). There the 34-year-old will share a Lamborghini Huracán GT3 of HB Racing with Marco Mapelli (I).